In 1965, His Divine Grace A.C. Bhaktivedanta Swami Prabhupada, traveled from India to New York City, on the instruction of his Spiritual Master, to establish the International Society for Krishna Consciousness (ISKCON), more commonly known as the Hare Krishna Movement. Soon, the Movement grew into a worldwide spiritual society, dedicated to transplanting the timeless spiritual culture of ancient India to the twentieth-century Western world. In 1971, after traveling around the globe, establishing sixty-five centers of ISKCON, Srila Prabhupada made an official visit to Moscow at the invitation of Professor G. G. Kotovsky, head of the Indian and South Asian Studies Department of the U.S.S.R. Academy of Sciences. 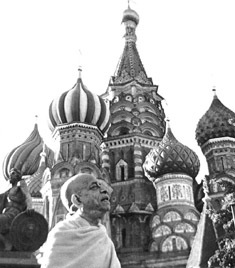 Srila Prabhupada hoped to speak extensively before Soviet audiences as he had addressed audiences during his travels throughout the world. However, upon his arrival in the Soviet capital, he found this was not possible, and it appeared his audience would be limited to this one Soviet Indologist. 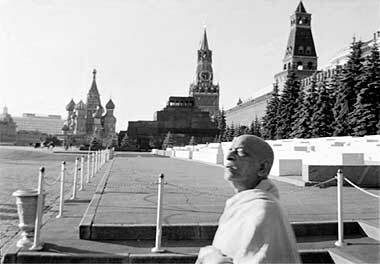 Srila Prabhupada had only one meeting with the Russian scholar. At that meeting, Srila Prabhupada expressed his eagerness to lecture before the interested academicians of the Academy, but the Professor flatly refused, stating that it would not be permitted. Professor Kotovsky cited the fact that numerous ancient Indian classics had been translated and published in the Soviet Union. They were so popular that the entire printing of each book had been sold out in one week. He also commented that the Soviet people had a great interest in ancient Indian culture. It could be understood that since there was such an extreme interest in the culture and philosophy of India, it had to be somewhat restricted, thus it was impossible for Srila Prabhupada to speak. One day two young men, one the son of an Indian diplomat and the other, a young Muscovite, met Srila Prabhupada's secretary on a Moscow street while he was out shopping. The secretary, a Western disciple, dressed in his flowing white robes and with a long tuft of hair at the back of his shaven head, attracted their attention. They went with him to the National Hotel to meet Srila Prabhupada in his room. The Indian boy was very friendly and helpful and offered to bring green vegetables for Srila Prabhupada. 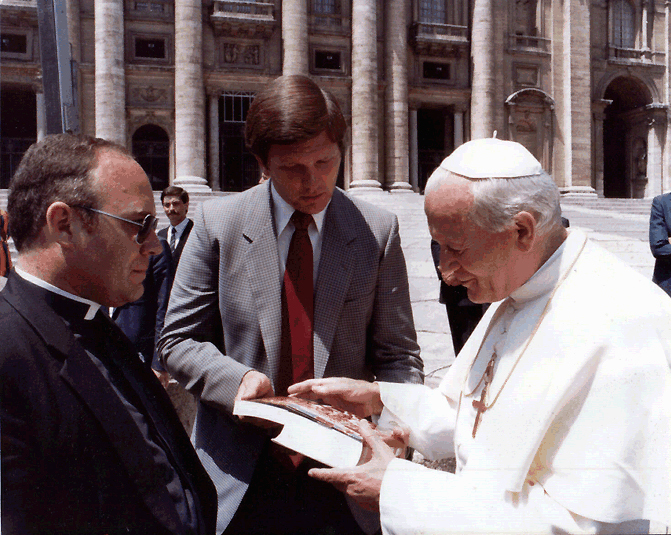 The Russian boy, Anatoli Pinyayev, was very interested in philosophy and Srila Prabhupada began explaining the philosophy of Krishna Consciousness conveying as much basic information as possible during the short visit. He also taught him how to chant the Hare Krishna mantra and sing traditional songs of devotion. HKUSSR Yahoo Groups email list. Primarily to notify group members of new website content, but group members may post as well. Making Submissions: If you have material regarding the history of the Hare Krishnas in the U.S.S.R., and would like to share it, you may do so in several ways. Simply send an email with your story to the webmaster, with your story as plain text, a Word document, or whatever is convenient, along with .jpg or other image files if available. Please try to include approximate dates and locations in your story. Please indicate if you do not wish your name mentioned. Your contact information (email address, etc.) will not be mentioned on the web pages unless you specifically request it. If you have material that needs to be scanned, contact the webmaster to make arrangements. We would be happy to scan and return material. If you wish to simply mail your story or materials, please contact the webmaster for address information. If you are submitting photos and would like to retain copyright on those photos, please let us know and we will include your copyright notice along with the photo on the web pages. If you have any concerns, please let us know and we will be happy to discuss them with you. This is an important story, please be generous and share your story with others. An important reminder: Much of this website concerns a time and a place somewhat removed from where we are today. It is not the intention of this website to say anything negative about the land and peoples of what used to be called the U.S.S.R / C.C.C.P.. All reasonable people know that there are both good and not-so-good people in every land, and that the person with a positive outlook really does believe that most people are basically good, and love and long for the same things they do. The important lesson of this, and similar stories is, that "politics" can make it easy, or easier, for bad policies to be put in place, and harder to curtail them when they get out of control. Perhaps that is one way to view things before the fall of the communist ideological dominance in the U.S.S.R. Anyway, we will try to do as Joe Friday on Dragnet: "Just the facts m'aam, just the facts. ", and leave the philosophizing to the reader. 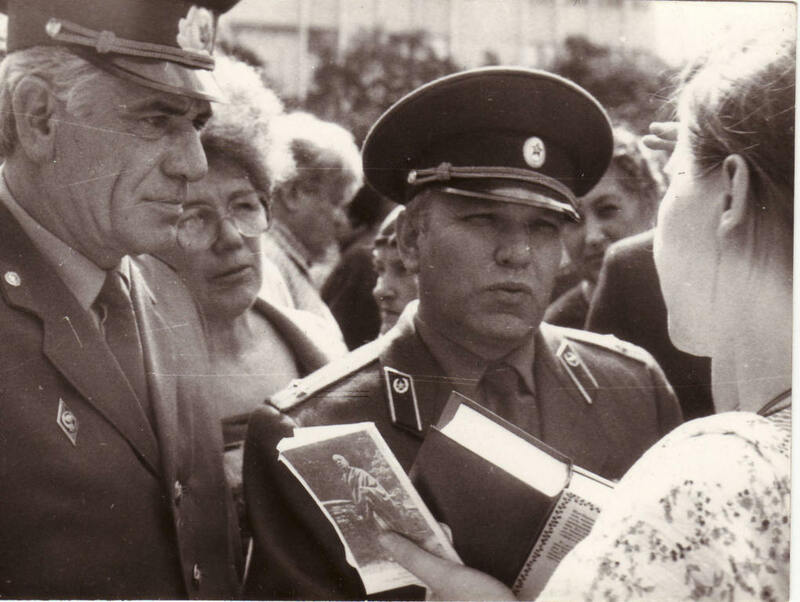 Why these stories are still important: The stories of the early days of the Hare Krishnas in the old Soviet Union are still very important, because they remind us that here in this material world, nobody is really "free" without surrendering fully to the Lord. We may THINK we are free, but we are told "you must work this job to earn money", "you must eat this food, drink this", "you need and must buy this automobile with a 5-year loan", etc., so it is only a matter of degree. The early Soviet Hare Krishnas set their sights on true Freedom, and gave up so much, in some cases everything, in its pursuit.